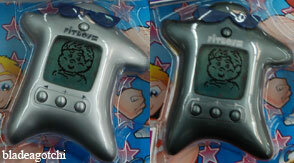 A dieting and exercise virtual pet! These groovy looking things appeared in January 2006, with a very different concept to most virtual pets - in this case, you're looking after the health of a person! Each food you feed it - there's lots and lots of them - has a different calorie rating, and you have to give it exercise to bring it's weight down and make it more healthy. If you don't, it gets fat and unhealthy. If it gets too fat and unhealthy, it has a heart attack and dies. 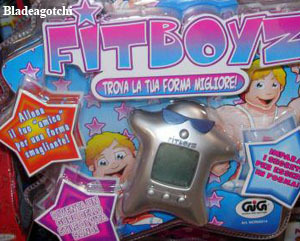 Pictured above are the two Fitboyz designs that I know of. One is silver, and the other is like a bronze colour. They've both got Sunglasses on the casing. Pictured above are the two FitGirlz designs that I know of. One is a fuchsia pink, and the other is aqua. There may be more designs that I don't know of yet. When you start it up, you enter your name and then your height and weight - you get to choose if you want to use metric (kilogrammes and centimetres) or imperial (pounds, inches and feet) measurements. I think the food values are only in calories (imperial) and there's no Kilojoules (metric) option. Also, I couldn't work out if you could pause it or not. 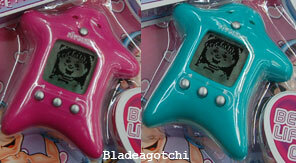 This virtual pet has a lot of activities. Instead of scrolling through icons like on traditional virtual pets, you press the arrow keys and pictures of different activities appear on the screen. There's about 70 different food choices, about 5 different games, about 10 different exercises, 3 different grooming activities and still more. I'm amazed at how much they've managed to cram into it! One of the quirks of this virtual pet is that once you start an activity, the character will keep doing it over and over until you tell it to stop for 15 minutes straight. So it can eat huge amounts of food, and do loads of exercise. It's got the cutest animations, but the sounds are a bit bland. For some reason, it randomly starts playing music, so I usually keep the sound turned off. It's rather fun to play with though, and I think overall it's a very neat idea. Pictured above is the packaging of the Italian release. These were released in early 2006 in Italy, the Netherlands (and elsewhere in Europe, I'm not too sure where) and in Australia. In Australia, they can be were found at K-Mart, Target and Toys R Us stores. They originally retailed for around AU$25, and Toys R Us still carry both of them as a normal line at that price. However, they're a clearance line at K-Mart and Target, so if you do manage to find one it will cost between AU$8 and AU$10 there. Fitgirlz were more popular than Fitboyz, I haven't seen a Fitgirlz at K-Mart or Target for a very long time. Otherwise, I've seen some online retailers selling them. I have noticed that European online retailers are selling them for around EUR 10. You might also wish to try eBay, but for some reason they tend to be more expensive. Pictured above are the Limited Edition Manchester United Soccer Team Fitboyz and FitGirlz! It's red and has the Manchester United (MU) Logo on it. In the MU Fitboyz, you are looking after a soccer player, while in the MU FitGirlz you are looking after the wife of a soccer player. I'm unsure of the release date, but they are currently for sale in the Manchester United Online Store! They are selling for GBP 9.99, which is around AUD$25. As of August 2007, they are in stock. I think this is a really, really neat idea! The above link takes you to the Electronic Toys Category of the Manchester United online store. 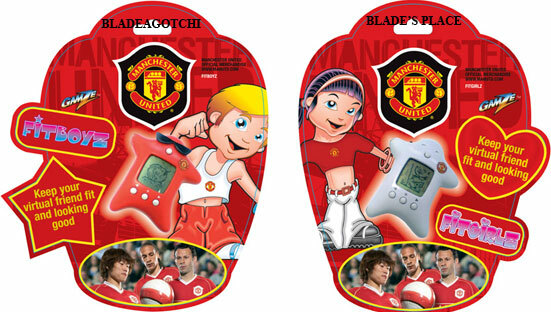 They also have other MU themed electronic toys.